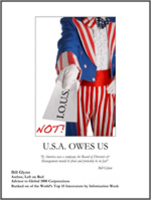 Bill Glynn Releases His Most Controversial Ideas in a New 40 Page Booklet I.O.U.S.A. NOT! USA Owes US! Bill Glynn, controversial author of “Left on Red,” ranked one of the top 15 innovators in the world, takes on economic and social issues looming over America and the world economy and offers simple to understand explanations and solutions for our woes. He has appeared with Fox Business network anchor Neil Cavuto, is a regular guest on over 80 radio stations and broadcast networks nationwide and has joined leaders including Hugh Hewitt, Rita Cosby, Ross Perot and many others in presenting his solutions on the failing economy. As a shareholder of this nation demanding solutions to America’s problems, Bill Glynn has written I.O.U.S.A. NOT! – USA Owes US. The document is 40 pages and free to download at http://www.billglynn.net . He addresses eleven sore subjects (only a few of many) that America must overcome in order to keep our society and way of life going. In the first chapter, The Silver Bullet, he outlines a variety of ways we can move forward to solve some the present economic woes and the many issues facing our country. According to Bill Glynn, if we allow the government to do more of the same, we will lose international confidence and will be cut off from those nations buying our debt that are keeping the USA from bankruptcy right now. As bleak as all this sounds, Glynn says his solutions are simple and attack the very cancer that is crippling our nation economically and socially. According to Glynn, his pioneering 10% solution to eradicate the U.S. deficit is among the most noted across the country. Glynn continues by saying, if you plan to vote for McCain and Palin or Obama and Biden this hand guide will wake you up and provide education and insight on issues everyone should understand going into one of the most important elections in our lifetime. Bill Glynn is a successful entrepreneur, author of Left on Red (Wiley & Sons) and voted one of the world’s top 15 innovators by Information week. He advises leaders of over 20 global 1000 companies, is an influential insider in music and film entertainment and manages, advises various venture funds and businesses he has founded, incubated or facilitated. He is credited with helping Chat and Instant Messaging become pervasive across the Web, the creation of landscaping appraising and insurance underwriting for landscaping, foundation work in securitizing private equity through the collateralized private equity obligation among many more. He has raised over $ 1 billion for the funds and private ventures he has helped create and advised. He serves the leadership of London’s Royal Institution’s World Science Assembly and the East West Institute where he focuses on the weaponization of science and harmonizing humanity among the major faiths on earth. Bill Glynn helped build Southeast Interactive Tech Funds and was an early investor in How Stuff Works; Arsenal Digital, Opensite, Instant Messaging (IM) and Chat; Tom Clancy Red Storm Entertainment, HAHT Commerce, Interactive Magic, he is the founder of Collective IQ, Money Grows on Trees, Horticultural Asset Management, Pearl Street Capital and works as a corporate venture and development advisor for Molson Coors, Xcel Energy, Fujitsu, Global Exchange, Wrigley, Teradata, Western Union, First Data, SAS, Alticor, Amway, Legendary Pictures, Provident Music, Landis Entertainment, CCLI, The Strategic Venture Association, The Gulf Venture Association, The Briner Institute, East West Institute, The Royal Institution in London among others. With numerous home owners dealing with foreclosure and looking for help throughout The us, many worthless providers have cropped up with such guarantees as house loan elimination or other foreclosure techniques that in some situations are patently unlawful. 1 typically marketed support is a Securitization Audit. A amount of businesses have been pushing forensic financial loan audits, aka TILA/RESPA audits. Since knowledgeable lawyers and house owners identify these audits are essentially ineffective, the “wolves in sheep’s garments are now peddling, securitization audits. Mortgage loan Fraud Examiners Founder Storm Bradford points out: The intended explanation provided for a securitization audit is to establish the real proprietor of a promissory be aware. Allegedly, with this info, the home-owner can display a courtroom that the get together in fact foreclosing on a mortgage is not the actual notice operator. Nonetheless, securitization arguments like, show me the be aware, assignment, MERS, robo-signing, and so on, generally quantity to practically nothing a lot more than just stalling the inescapable–the house owner getting booted to the curb. None of these hopeless arguments alterations the important fact the Court docket in a judicial condition Must give aid and solution to the financial institution or assignee, simply because the borrower breached the agreement. And in a non-judicial states, the non-public trustee implements a personal sale to a buyer with out a judges involvement. No one ever seems at the troubles raised by the securitization audit. So only the uninformed would consider a securitization audit could be anything at all far more than worthless. As a consequence, knowing who owns your note is like knowing the earth speeds via the universe at 67,000 miles an hour, its generally worthless details. Nevertheless, as a courtesy to property owners they can get in touch with us and wed be a lot more than happy to display them how to acquire details about the owner of their observe for Free of charge. Gregory Bryl, a foreclosure protection attorney practising in Virginia and Florida, clarifies: most securitization audits that I have reviewed are inadmissible in a courtroom of legislation they include a mere impression of a layman with out private understanding (direct encounter) as to what happened with a distinct home loan observe after closing. Why spend a securitization auditor when you can have your grandmother provide an impression as to what happened with the notice and have her indication an audit report? In reality, in about 95% of all instances, the information equipped by a securitization audit is both presently publically available, or it is unavailable to possibly the home-owner or the auditor. Thus, in which a home-owner genuinely lacks this info, an outsiders opinion (in distinction to the financial institutions admission) is unlikely to assist. Thomas K. Plofchan, Jr., an legal professional in Sterling, Virginia, who employs the services of Home loan Fraud Examiners, adds: Ultimately, the only actual situation is no matter whether a correct lien has been developed with the residence as collateral. It is astonishing just how many legal problems, deal breaches, and frauds, can be uncovered by a meticulous assessment of the house loan transaction. Matter of fact, in two current instances we have been ready to recognize and create proof to display the deeds of believe in had been void. The end result for the house owners was acquiring their respective residences cost-free and obvious. So, its quite very clear, a comprehensive assessment of the mortgage agreement is the ONLY confirmed method to uncover proof that could influence the validity of the lien. Home loan Fraud Examiners is a venture of Lex Consulting, LLC, for in excess of thirty years, Lex Consulting has offered litigation support to lawyers, supporting them crack into new places of exercise, or providing specialised suggestions for complex situations necessitating novel ways to the regulation. Thanks to the housing crisis, Mortgage loan Fraud Examiners, a team of specially educated authorized specialists, was developed to provide borrowers and the authorized community with thorough support to assist them hold them in their homes.